Semi-desert, desert. Grasslands, shrublands, openings. Spring. Calochortus flexuosus is one of three lovely members of this genus abundant in the Four Corners area. The other two are Calochortus nuttallii (the state flower of Utah) and Calochortus gunnisonii. Calochortus flexuosus grows in the hot, dry areas of the lower elevations of the Four Corners. Its lovely petals have a low band of yellow and above this petals range from white to light lavender. Stems flex and bend and leaves often have a distinctive curl at their end. Leaves may be present at flowering time or may have already withered. With their grass-like leaves and stem and their exotic, vase-like flowers, the three Calochortus species are favorites among many wildflower enthusiasts. Aptly, "Calochortus" from the Greek "kalos", means "beautiful". "Chortos" means "grass" and refers to the grass-like leaves. "Mariposa" is Spanish for "Butterfly" and "Sego" is a Shoshonean word for "edible bulb". On May 17, 1806, near what is today Kamiah, Idaho, Meriwether Lewis collected the first plant of the genus that came to be called "Calochortus". 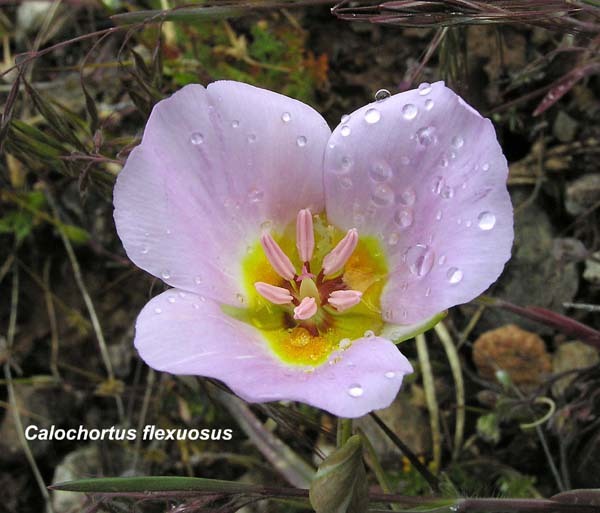 The plant was given to Frederick Pursh for analysis and he assigned the new genus and species names, Calochortus elegans. The first Calochortus flexuosus was collected by Ms. E. P. Thompson in Utah in 1872.